Stirling Castle is one of the largest and most important castles, both historically and architecturally, in Scotland. The castle sits atop Castle Hill, an intrusive crag. It is surrounded on three sides by steep cliffs, giving it a strong defensive position. Several Scottish Kings and Queens have been crowned at Stirling, including Mary, Queen of Scots, in 1542. There have been at least eight sieges of Stirling Castle, including several during the Wars of Scottish Independence, with the last being in 1746. <p> The Nether Bailey occupies the lower part of the castle rock, to the north of the main area of the castle. It is accessed by descending through the North Gate, probably the oldest standing part of Stirling Castle. <p> Castle hours of operation are: April 1st - September 30th Monday through Sunday, 9.30 am to 6.00 pm (18:00). October 1st - March 31st Monday through Sunday, 9.30 am to 5.00 pm (17:00). Last ticket sold 45 minutes before closing. <br> Admission prices are: Adult: £14.00 (aged 16-59), Child £7.50 (aged 5-15. Children must be accompanied by an adult or concession visitor), Concession: £11.00 (aged 60 and over, unemployed), and a Child under 5 is free. <p> You must pay admission to gain entry into the Castle. No admission is required to access the Nether Bailey once you are inside the Castle. 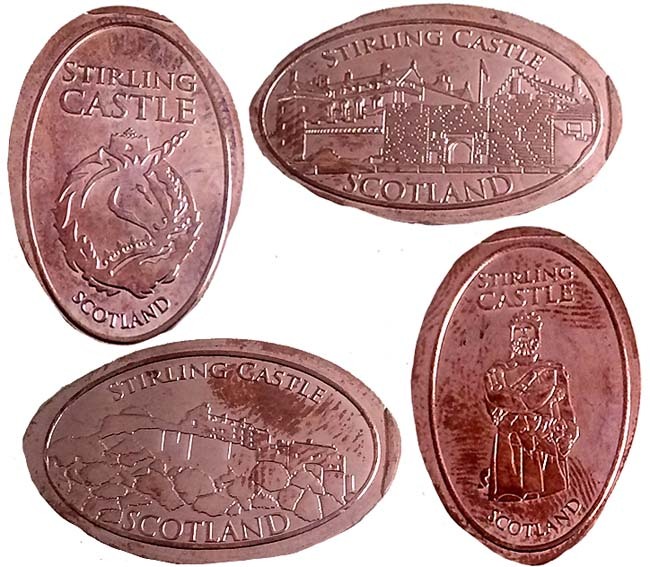 <p> There are 4 designs and All designs say 'Stirling Castle Scotland'. Designs are: <br> 1) Unicorn head logo, <br> 2) Castle, <br> 3) Castle on rock, <br> 4) King <p> Retired Design had a beaded border:<br> 1. (V) The Argyll & Sutherland Highlanders crest with 'Argyll & Sutherland Highlanders'.<p> G.P.S. coordinates: Latitude: 56° 7' 26.4858" Longitude: -3° 56' 55.2768". <p> 8/12/18. The penny machine is not at the Argyll Museum, it is at the Nether Bailey in the first building that you come upon down towards the Tapestry building. Stirling Castle is one of the largest and most important castles, both historically and architecturally, in Scotland. The castle sits atop Castle Hill, an intrusive crag. It is surrounded on three sides by steep cliffs, giving it a strong defensive position. Several Scottish Kings and Queens have been crowned at Stirling, including Mary, Queen of Scots, in 1542. There have been at least eight sieges of Stirling Castle, including several during the Wars of Scottish Independence, with the last being in 1746. The Nether Bailey occupies the lower part of the castle rock, to the north of the main area of the castle. It is accessed by descending through the North Gate, probably the oldest standing part of Stirling Castle. Castle hours of operation are: April 1st - September 30th Monday through Sunday, 9.30 am to 6.00 pm (18:00). October 1st - March 31st Monday through Sunday, 9.30 am to 5.00 pm (17:00). Last ticket sold 45 minutes before closing. Admission prices are: Adult: £14.00 (aged 16-59), Child £7.50 (aged 5-15. Children must be accompanied by an adult or concession visitor), Concession: £11.00 (aged 60 and over, unemployed), and a Child under 5 is free. You must pay admission to gain entry into the Castle. No admission is required to access the Nether Bailey once you are inside the Castle. 1. (V) The Argyll & Sutherland Highlanders crest with 'Argyll & Sutherland Highlanders'. G.P.S. coordinates: Latitude: 56° 7' 26.4858" Longitude: -3° 56' 55.2768". 8/12/18. 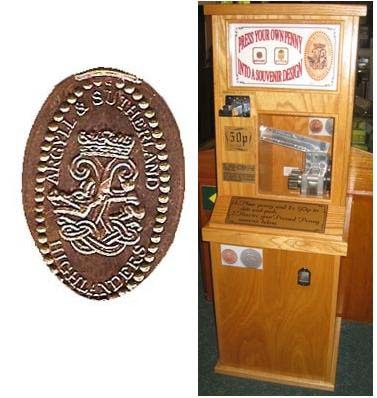 The penny machine is not at the Argyll Museum, it is at the Nether Bailey in the first building that you come upon down towards the Tapestry building.